Born in 1971, Ian Greensitt grew up in Tynedale and went to school in Newcastle. He had his first sculpture commission at the age of 9, when the headmaster of his prep school asked him to sculpt a brown trout for his study. Subsequently, Ian studied abstract sculpture at Northumbria University, graduating with a BA (Hons) in Sculpture in 2001. Since then he has pursued his twin passions of fishing and wildlife art. 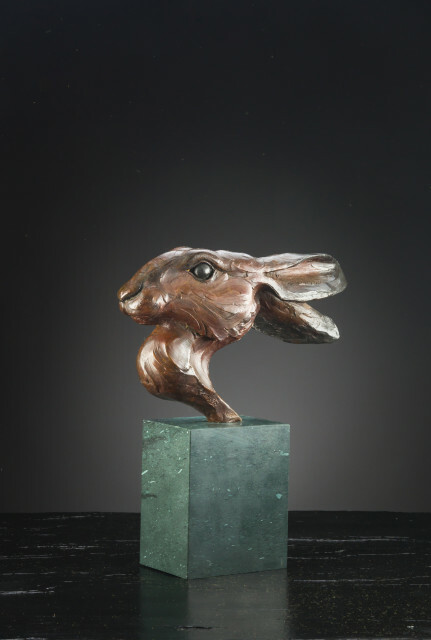 In his early career he worked in ceramic, particularly with fish, and this helped to develop the refined style of his bronze and silver work, capturing the grace and movement of his subject whilst maintaining its vitality. His first commissioned bronze sculpture was in 2001 for the CLA’s Arthur Oglesby trophy, a magnificent salmon, which was cast using the “lost wax” process. In this form of casting, no two bronzes are exactly the same, with each piece having its own unique patina colouration. Detailed sketches always precede his sculptures and his wildlife drawings provide an interesting addition to his portfolio. Ian’s work is exhibited throughout the UK and America and he has a worldwide list of collectors. In 2006 Ian donated a ‘Curlew’ in bronze to the Game Conservancy Council’s Scottish Auction, together with a ‘Grey Partridge’ in bronze to the October 2006 London Sporting Auction in aid of the grey partridge recovery project in Northumberland. Ian’s passionate commitment to the conservation of wildlife remains as strong as his dedication to his art.